Peony stakes can be used for any type of bushy, flopping plant. Staking plants is nobody's favorite garden chore. Maybe that's why so many of us wait until the poor plants are already bending and flopping before we take the matter in hand. Staking your plants in the spring means you will have a few weeks of visible, sometimes ugly stakes in the border, but it will save many headaches throughout the rest of the growing season. Here are some tips to make it less of an eyesore. It helps to start with natural looking materials. Branches and bamboo fit in with garden plants better than metal and wooden stakes. However, there are places where metal rings make life easier and sometimes the strength of a square wooden stake is necessary. Using biodegradable tying material, like twine, will not only blend in more naturally with the garden, it will make fall cleanup easier since twine can go right into the compost. Tall Plants FirstWhich plants to stake are a matter of preference. Some exceptionally tall flowers, like hollyhocks and delphiniums, absolutely need staking. They will look fine one day and then wind or rain will level the whole lot of them. Once down, they won't pop back up. In many cases, fallen stems will begin to bend up from where they hit the ground, growing in a kind of 'S' shape. Floppy Plants Give You a ChoiceOther plants are more subjective in their need for staking. Flowers like daisies, asters, and coneflowers might flop over on other plants, but you might enjoy the informality of a more natural garden. You can also control the height of these plants by pinching or cutting back the plants earlier in the season. This encourages them to grow more bushy and substantial and less tall. Twiggy, fanned out branches from your tree or shrub pruning can be used as natural supports for border plants. These branches are often referred to as pea staking or trellis because they have been used for years to support pea plants. Stick the branch close by the perennial in the spring and eventually the flowering plant will grow through and cover the twiggy branch. Choose a twiggy branch that is about 6 to 8 inches shorter than the mature height of your perennial. Tall PlantsTall, straight perennials can be secured to a thin bamboo stake placed close to the stem. Put the stakes in early in the spring so that you are not damaging roots later in the growing season. Tie the plant loosely to the stake by twisting the twine into a figure eight, so that the stem is not pulled tight up against the stake. Plants with large flowers, that tend to be top heavy, will need to be tied to the stake all the way up to the flower. 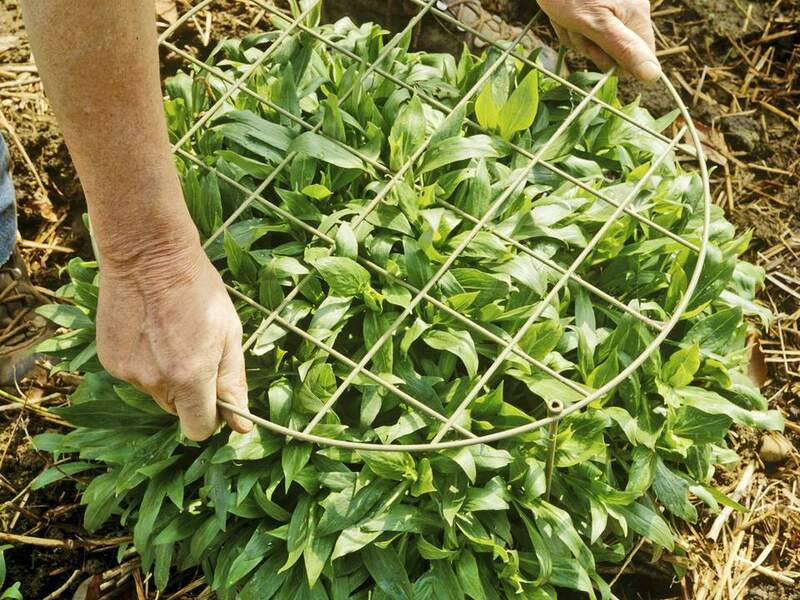 Staking Plants that ClumpYou can support a clump growing plant, like coreopsis or asters, by circling the clump with bamboo stakes and wrapping twine around the perimeter of the stakes, forming a kind of cage. This will support the entire bottom growth of stems while allowing the clump to retain a natural shape on top. Staking Plants that SplitSome plants simply need a little side support, like peonies. Peony rings are sold in most all garden centers. They are either an open ring or a ring with a wide spaced grid and three or four legs. Place these about 4 to 6 inches above the plant as it emerges in the spring. You can slowly raise the legs a bit as the plants begin to grow through the ring. Don't disturb the rings once flowers buds have set. When spring staking is well done, it makes the garden look better throughout the season. It also makes maintenance easier, because you will not have to lift and move dropping plants off one another. You will probably discover plants you wished you had staked, as the season matures. Make notes for next year.